Whitby Town striker Mikey Roberts has been highly commended in the Evo-Stik Northern Premier League awards. Roberts, 24, has netted on 20 occasions for the Seasiders this season, in a campaign which has seen them battle at the wrong end of the Premier Division table. The talisman made the final 15 for the Player of the Season award, but just missed out on a place in the top five. Despite missing out, the former Spennymoor and Guisborough man was still delighted to see his efforts recognised by fans across the division, but insists he will not be distracted by the accolades. “I’m over the moon to be recognised and highly thought of by the people who vote - the supporters,” Roberts told the Whitby Gazette. “To be nominated is one thing, but to be high up on the list is another. 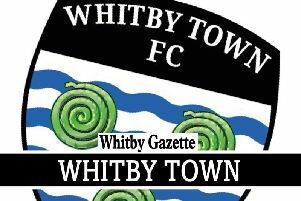 Roberts’ latest goal came in Whitby’s tight 1-0 win over Buxton on Saturday, following a run of six games without a goal. “I was very relieved to get the goal,” he admitted. “It’s been tough in these last few games, playing out wide and then spending then last two on the bench. Whitby travel to Skelmersdale United on Tuesday night, with the chance to open the gap between themselves and fellow strugglers Stamford to four points. Roberts believes the mood in the camp is high, going into the game. “We haven’t really been short of confidence at any point. It just depends on if we’re taking our chances or not,” he said. “We’re playing well enough to win all, if not the majority of the games at the minute.